Leader of the All Progressives Congress (APC) in Rivers State, Rt. Hon. 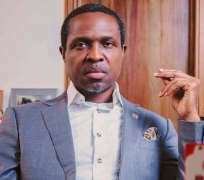 Chibuike Amaechi, has intimated stakeholders of his decision to back business mogul Tonye Cole as the party's governorship candidate for the 2019 elections. Incumbent Governor Nyesom Wike of the Peoples Democratic Party (PDP) is the man to beat in the polls. “We are aware that not all would find it easy to accept the decision but I am also conscious that the decision was made for the best interests of the party and the group,” Amaechi, who is the Minister of Transportation, said in a text message seen by News Express on Friday. Continuing, the immediate past Rivers Governor said: “We are aware that interests are divergent and numerous. And that they can only coalesce if we get someone neutral; someone who is able to get every interests to converge as one. “What is critical is victory. Loyalty is not only when it favours you but when you are tempted and stretched to your limits.